From the early summer of 1988 until the Summit investment in February1989 I worked to strengthen the management team since I was partially incapacitated by my illness. Our OEM sales were still headed by me, with sales reps reporting to Dean Barnes my OEM Sales Manager reporting to me. In addition our international sales were growing. I needed to fill two positions quickly. First, I needed an OEM VP of Sales. Tom Miller had heard about our success and was interested in joining the company. Tom had worked for disk drive manufacturers in San Jose and had experience in the industry. I brought him down to interview with Patty, Al, Mike and me. Patty had some reservations, but we decided to hire Tom. We hired Tom Miller in December of 1988. Tom was experienced with the manufacturers’ reps that I had signed; his job was to manage the rep network, continue to grow OEM sales and close business for Future Domain. I put him in charge of International Sales first and later all Sales with Barnes now reporting to him. Tom would hire Terry Green to fill the International Sales position. Shortly before Tom arrived the first storm cloud formed around Mike Shaw. One day Mike does not show up for work and he did not call in. The next day I had my assistant call him, she said he told her he was sick, but would be in the next day. She told me he “did not sound right, like he was drugged”. Finally he comes to work, but not in his car. He had bought a new BMW after sales had taken off and he was getting fat commission checks. I thought it was extravagant but I was used to the way sales people acted by now, so I was not surprised. I asked him what was going on, and where was his car. He made up a story about it being in for service, and that he had a cold. I dropped it, but in a small company secrets do not keep. The receptionist told my assistant that Mike had gotten several calls from a Lawyer that morning and she overheard something about drunk driving. I called Mike in again, I told him he better tell me the truth or he would be looking for another job. He then admitted he had been in an accident on the freeway, and had just about totaled his new car. I asked if he was drunk, no he said, he had taken “muscle relaxers” the doctor had prescribed after he sprained his back that weekend. I did not believe him. I told him that if he had one more incident like that I would terminate him. A couple of months later, just after the Summit investment funded, I got a call from the manager of the local sales branch of Arrow Electronics complaining about Mike. This is the branch Mike had originally worked at so I was surprised. The manager told me that Mike had upset the entire sales team, and that they would not work to sell our product. 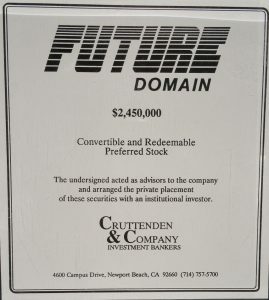 I ask why, he told me Mike had come in and bragged how he owned 20% of Future Domain (untrue, he had a very small stock option plan that vested over five years) and was going to be rich, more specifically that “you poor slobs are going to make me rich”. At first I did not believe the Arrow Manager, but then he produced the evaluations of the sales training and the comments about Mike were scathing. I contacted corporate sales at Arrow and asked for an evaluation, it turned out that other sites had seen this behavior, the behavior was unacceptable. I called Mike in and at first he denied he had done anything wrong. I then presented the evaluation, and he then said that the people at the local branch were “out to get him”. This alarmed me, I told Mike I had talked to Arrow corporate and they confirmed his actions. This was the second time he had lied to me and tried to blame others. I no longer felt I could trust him, and I felt that the relationship with Arrow would be in jeopardy if I did not take action against a sale person who had insulted their sales force. I discussed the issue with Tom Miller, I knew he was Mike’s friend, but I felt he would look at the issue from a professional angle. Tom agreed that Mike had a problem, but felt that if I put Mike under him that he could fix Mike’s problems. As a result I reorganized sales and made Tom Vice President of Sales in early 1989 and placed Mike under him as Distribution Sales Manager. By March of 1989 I was in pretty bad shape. The effort required to complete the venture capital funding and fill the remaining management positions had taken its toll. I began more intensive treatment for my Arthritis and Psoriasis including a one month stay at the Dead Sea in Israel. I hoped that the team I had in place could keep the company on track. In May of 1989 I got a call from Larry Lapard at Summit, did I know that Mike Shaw, our Distribution Sales Manager, had visited him that day to try to sell his Future Domain stock? I was shocked, I told Larry I did not know about that, but would get to the bottom of it. I was still nowhere near my capacity to do work as I had before my illness struck, but by May I had recovered enough to go into work almost every day for a little while, I made very few visits to customers or distributors. What I came back to was a disaster. It was now May of 1989, we were a quarter into our new fiscal year (FY1990). I called Mike Shaw in my office. When I had done the deal with Summit, they offered to buy 5% of the stock back from Patty and me, as a way for us to participate in the gains the company may get in the future. I decided to extend that offer to all shareholders. Mike was part of that purchase because he had stock options and some had vested. We informed everyone who had options they could exercise what was vested and sell 5%. At that time Mike came to my office and asked if he could sell all his stock! I explain to him that he could only sell what was vested. He said he had options for 17,000 more shares and needed the money, could he sell to Summit directly? I said no, I told him that these people had just invested over $2 million in the company, and you want to dump your stock! I explained to him that his stock agreement required that he come to me as majority shareholder before approaching anyone about selling his stock. I explicitly told him not to contact Summit in February 1989 when we did the redemption. In May, Mike was on a sales trip to the east coast, and I get a call from Summit in Boston. Mike had stopped by and wanted to sell his stock! Mike was not even supposed to be in Boston, he was supposed to be in New York. I called Herb, who told me Mike had also talked to him. I called in Tom Miller, and told him what happened. I told him I was going to fire Mike, and asked if he had a problem with that. He said no, that he had been having problems with Mike over the last few months, and we needed a change. When Mike got back I had Tom terminate him on May 7th 1989.